Educational institutions in Australia like The Scots College were founded with a vision for holistically forming young men in ancient truths and traditions for the service of the common good. Almost 125 years later, our culture doubts the reality of truth and questions the utility of traditions. What place might they have in educating the whole person in the fractured world of the twenty-first century? In this public lecture, Professor Bebbington surveyed the history of Christianity and higher education in Europe since the 12th century, exploring the origins of Presbyterian and other educational ventures in Australia and considering their relation to contemporary public concerns. Along with the Clark Lectures and the Ethos Conference, Professor Bebbington spoke to a number of different audiences at The Scots College, including students, teachers and senior leaders. 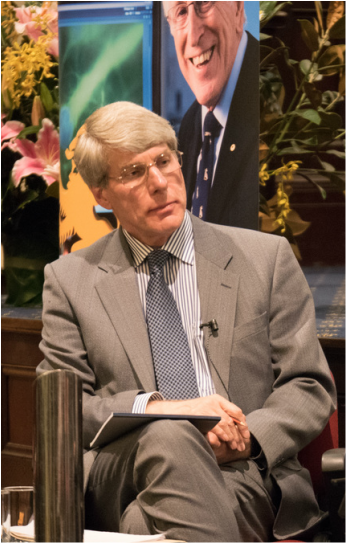 The 2015 Clark Lectures with Professor David Bebbington from tscdigitalmedia on Vimeo. Professor David William Bebbington – one of the most influential historians working today – is widely acknowledged as a world authority on religious history. He is also recognised for having devised the Bebbington Quadrilateral as the standard definition of evangelicalism, one of the most important global religious movements of the twenty-first century. An undergraduate at Jesus College, Cambridge, David Bebbington began his doctoral studies there before becoming a research fellow of Fitzwilliam College, Cambridge. Since 1976 he has taught at the University of Stirling, where from 1999 he has held a personal professorial chair in History. He has also taught at the University of Alabama, Birmingham, at Regent College, Vancouver, at Notre Dame University, Indiana, at the University of Pretoria, South Africa, and at Baylor University, Texas. He is an elected Fellow of the Royal Historical Society and in 2006-07 he was the President of the Ecclesiastical History Society. He has written or edited seventeen books, most notably Patterns in History (1979); Evangelicalism in Modern Britain: A History from the 1730s to the 1980s (1989); Victorian Nonconformity (1992); The Mind of Gladstone: Religion, Homer and Politics (2004); Baptists through the Centuries: A History of a Global People (2010); and, most recently, with Oxford University Press, Victorian Religious Revivals: Culture and Piety in Local and Global Contexts (2012). He has delivered a number of notable public lectures, most recently the Hughey Lectures at the International Baptist Theological Seminary, Prague (2008), the Friends of Dr Williams's Library, London, Lecture (2010) and the Moule Lecture at Ridley Hall, Cambridge (2012).